Summary: Google profits are paying for Larry & Sergey's losing "bets"--before it's all over Google stockholders will have lost billions to the billionaire boys gambling it all away! Alphabet up after Q4 beat; paid clicks surge, big losses reported for "Other Bets" - Alphabet Inc. (NASDAQ:GOOG) | Seeking Alpha: "Alphabet/Google's (GOOG, GOOGL) Other Bets reporting segment, broken out by itself for the first time, had 2015 revenue of $448M (+37% Y/Y), and an operating loss of $3.57B (up from $1.94B in 2014). The segment's Q4 revenue totaled $151M (+42% Y/Y), and its op. loss $1.1B. Other Bets includes Google Capital, Google Fiber, Nest, Calico, and the Google X long-term R&D unit, among other things." 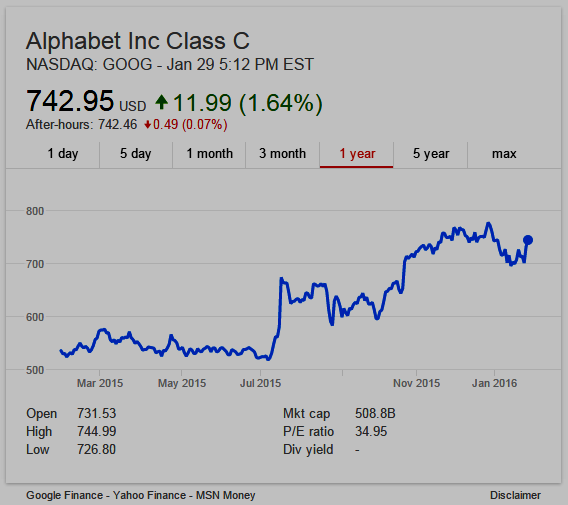 Alphabet Inc. (NASDAQ: GOOG, GOOGL) conference call to discuss fourth quarter 2015 financial results: Monday, February 1st at 1:30 p.m. Pacific Time (4:30 p.m. Eastern Time). LIVE webcast of the earnings conference call can also be accessed at investor.google.com/webcast.html. A replay of the webcast will be available through the same link following the conference call. Visit the Investor Relations website at investor.google.com on February 1, 2016 to view the earnings release prior to the conference call. "Larry Page and Sergey Brin founded Google in September 1998. Since then, the company has grown to more than 50,000 employees worldwide, with a wide range of popular products and platforms like Search, Maps, Ads, Gmail, Android, Chrome, and YouTube. In October 2015, Alphabet became the parent holding company of Google. You can read more about Alphabet’s mission here." See also: Something Is Wrong With The U.S. Stock Market | Seeking Alpha: "Alphabet (NASDAQ:GOOGL) has held up better than AMZN and NFLX, but the clear star of the FANG stocks has been Facebook (NASDAQ:FB), which is near its all-time high"